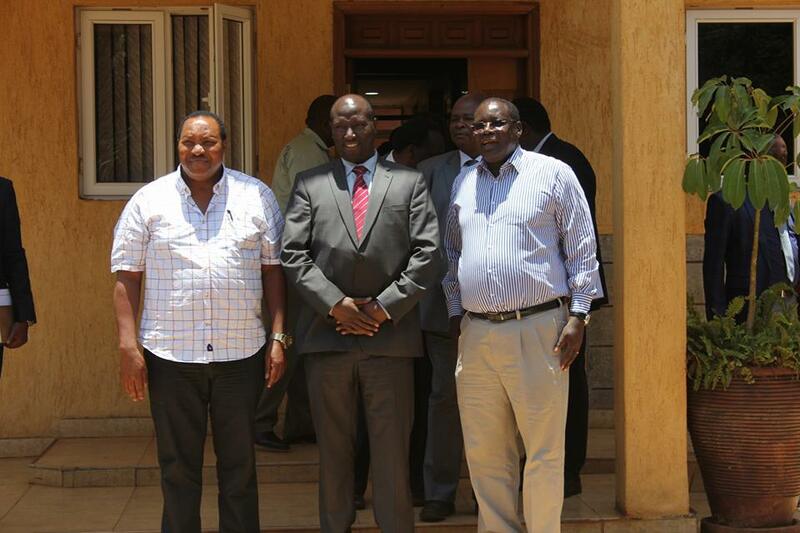 Kiambu Governor Ferdinand Waititu (left), KeNHA DG Peter Mundinia (centre) and Deputy Governor James Nyoro outside the county headquarters after the signing of a KES. 38 billion infrastructural development pact on Wednesday. Kiambu County Government (KCG) has signed a mega infrastructure pact worth KES. 38 billion with the Kenya National Highways Authority (KeNHA). The agreement was signed on Wednesday following a meeting at the Kiambu headquarters in Kiambu town between Governor Ferdinand Waititu and KeNHA Director General Peter Mundinia, marking the first step in fulfilling the governor’s promise to build county highways and roads. According to the governor, a total of 13 roads will be built by KeNHA which include James Gichuru-Rironi Road, which will cost Sh16 billion, the Western Bypass, which cuts through Wangige, Ndenderu and Ruaka (Sh17 billion) and Sh4 billion to be used for the construction of the Ruiru-Githunguri-Uplands Road. He added that the contractors have already been identified and work is ongoing on some of these roads. KeNHA DG Peter Mundinia acknowledge the importance of his authority partnering with county governments and local leadership. “The support from local leadership has been good, even in other counties, and this has helped us evict all those who have encroached on road reserves and where land earmarked for infrastructural development has been grabbed,” he said. Mundinia added that, in a bid to ease the menace of traffic jams in Thika Town, they were sourcing for funding to do some raft infrastructural development. He said they were in the process of acquiring a piece of land to expand the road exit at the Thika superhighway junction near the Blue Post Thika as well as expanding the existing bridge. KeNHA has also acquired some land near Njomoko on your way to Ngoingwa Estate that will be used to construct an interchange to ease congestion to and from the town. Another interchange will be built at the Gatitu junction that links Kenyatta Highway and the Thika-Garissa Road. While addressing the house on September 19, 2017 during the ceremonial opening of the first session of the 2nd assembly, Gov. Waititu said that his government would support expanded investment into infrastructure development as the need for infrastructure projects was enormous. He promised to buy one grader for each constituency to make sure that all impassible roads were upgraded besides tarmacking all access roads across the county. He also promised to tarmac all the major roads connecting economically potential areas within the first one year in office, notwithstanding embarking on a rigorous programme to ensure all the rural access roads are upgraded to murram level. The expansion of the Chania Bridge and the consequent construction of the Haile Selassie Road exit to the Thika Superhighway is intended to ease traffic congestion that has been a thorn in the flesh for Thika residents for quite some time. Before the temporary measures undertaken to open up the said exit, it was the norm for motorists to be stuck in traffic jams for hours especially during the rush hours. The most affected roads being Kenyatta Highway, near the Gatitu Junction and the Blue Post exit where the jam extends well into the town center and at times bringing activity to a halt. Other roads earmarked for construction include Thika-Metro-fill, Karatina-Garissa Road and the 28km Thika By-pass being funded by the Kenya Urban Roads Authority (KURA). According to the designs presented by KURA earlier this year, the bypass will exit the Nairobi-Murang’a Highway at the Del Monte shop near Thika Sports Club, run through the company’s farm, branch towards Makongeni Estate near its factory offices to join Garissa Road at the BAT junction. KURA Ag. Director General Eng. S.M. Kinoti said that the construction works are scheduled to begin early 2018 and go on for the next two years. It was revealed that this road had earlier been planned to start co-currently with the one at Kivulini but its programme got delayed due to financial and logistical constraints. The Kivulini-Kang'oki-Kiganjo By-Pass has already kicked off with tenders for the construction works for the Engen-Kiganjo, Metro-Kiandutu and Gatitu-Castle feeder roads have already been awarded to Chinese contractors. The By-Pass will divert all motorists from Garissa and Machakos Counties who didn't have any business to do in Thika, to branch from Kivulini in Kisii Estate into the Bypass to join Thika Road near the former Castle Breweries. As a result, they would have avoided the current Garissa Road at Makongeni area, which has been a pain in the neck for these residents. The vehicles will also have evaded the notorious Garissa Road- Kenyatta Highway Junction near Gatitu, another traffic headache for Thika residents.